For this assignment for Rensselaer School of Engineering magazine, the challenge was to show Rich Heley, chief engineer of Apple’s iPhone manufacturing project, in a way that emphasized the intricate precision of the development process, and his own personal attention to detail. We didn’t have access to the research labs (Apple is very very secretive about that! ), but we did have a conference room, boxes and boxes of iPhones cases, a large table, lights and time. After exploring several setups, including Rich lying on his back in a sea of phones, we settled on this direct upward-looking serious yet cheerful gaze, which the Art Director chose for the spread. 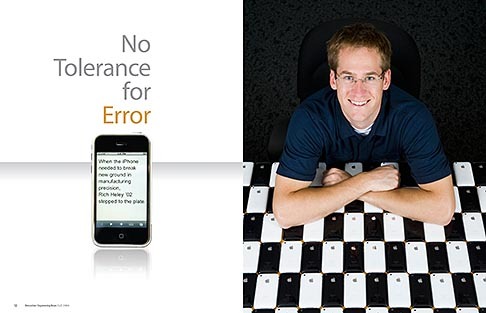 You can read more about Rich and Apple and download the story No Tolerance for Error(pdf) from the RPI website. faster on internet explorer. seems to have gotten faster in last few minutes. internet explorer on vista. still slow. stock section really fast. There have been some problems with comments and hopefully they have been fixed now. Let me know by email if you still cannot logon to leave comments.